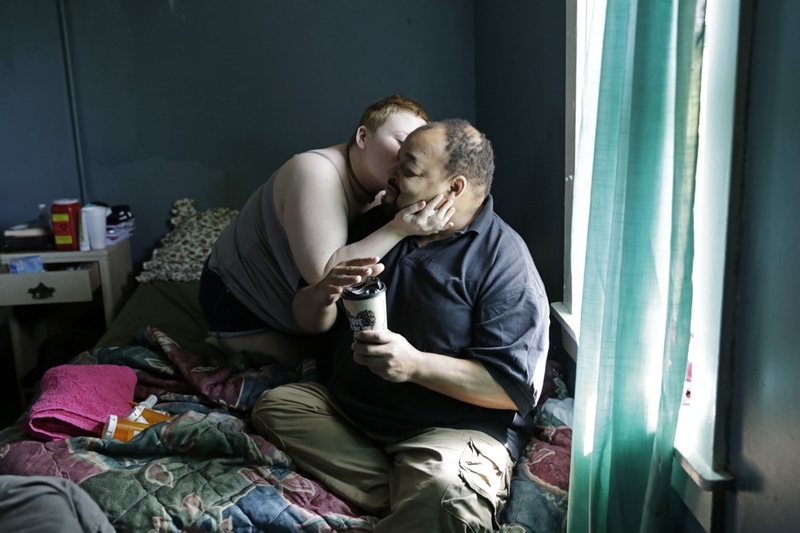 Angel Davis kisses her boyfriend David Nelson at the Travel Inn Motel in Cave City, Ky. After meeting at a homeless shelter in Illinois 2 years ago, the couple moved to Bowling Green, Ky. in hope for help from Angel’s family who lives in Caneyville, Ky.
Laurie Brown eats a ham sandwich in Travel Inn motel in Cave City, Ky. a job interview at DART Container Corporation. Laurie, boyfriend Michael Brady and friends Angel Davis and David Nelson pooled their resources and splurged on 4 nights in the motel. Laurie's vehicle is the prime way the group is able to advance their goals. The vehicle repeatedly overheats. David Nelson and his girlfriend Angel Davis joke around while the group tries to figure out what to do next. 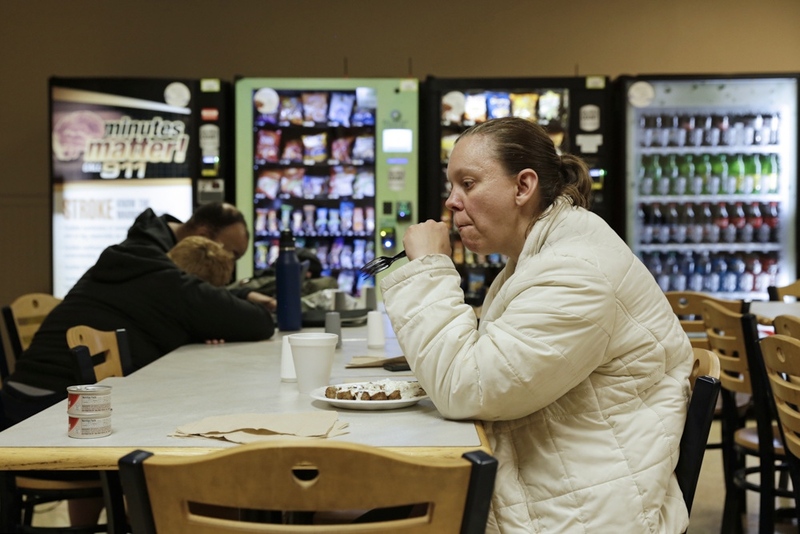 Trying to use up the freezer food they bought while in a motel, the group eats at the Medical Center cafeteria in Bowling Green, Ky., because there is free use of a microwave and space to spread out their food cache. 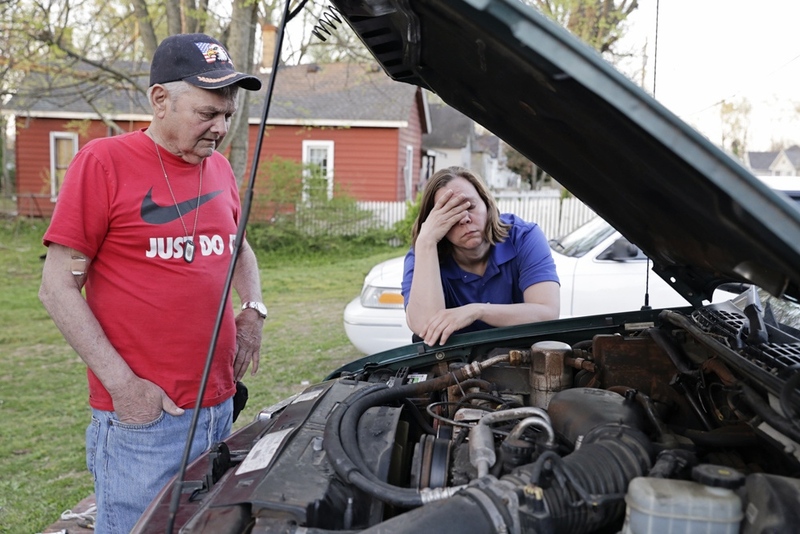 Laurie Brown is distressed after her vehicle overheats and consequently won't run, yet again. Having a vehicle can be a golden ticket to folks who are homeless. Michael Brady and girlfriend Laurie Brown prepare for bed in a storage unit. A former Marine, Michael was hit by a car that left with him with many injuries including a fractured skull and broken ribs. 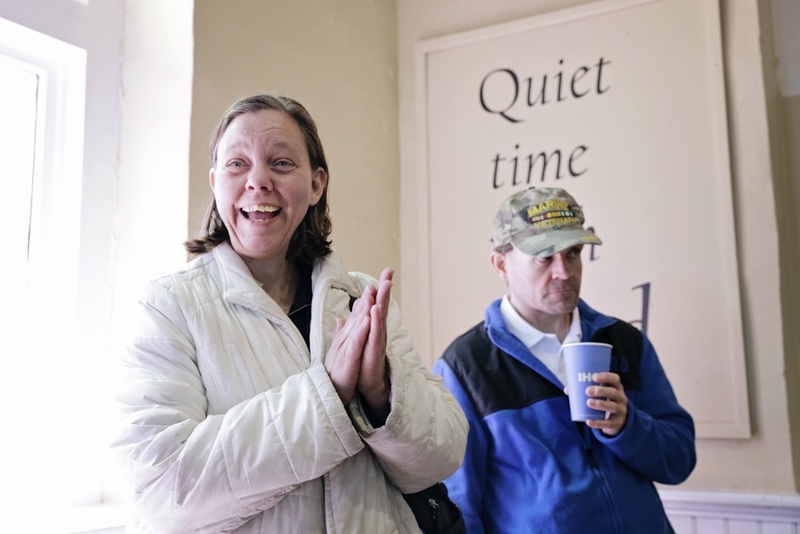 Laurie Brown cheers for a person ringing the church bell at Hotel Inc. (Helping Others Through Extending Love in the Name of Christ), a prominent homeless services center in Bowling Green, Ky. The bell is rung when a person has found permanent housing. Laurie Brown changes for a one day temporary job in the Riverview Park bathroom, in Bowling Green, Ky. The park is a popular place with many of Bowling Green's homeless population. 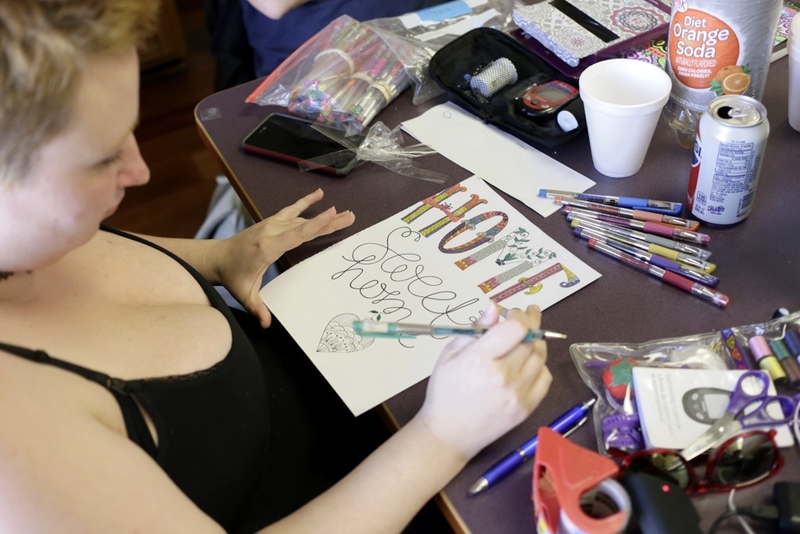 Angel Davis colors a page out of her coloring book at the public library, another popular spot with the city’s homeless population. She hopes to hang the page when the group secures permanent housing. David Nelson hugs Angel Davis after a fight about the cost of food at an IGA. This was the first hot meal they had eaten in several months. Laurie Brown steps outside of an IGA in Bowling Green, Ky. to calm down after a confrontation with another homeless woman. 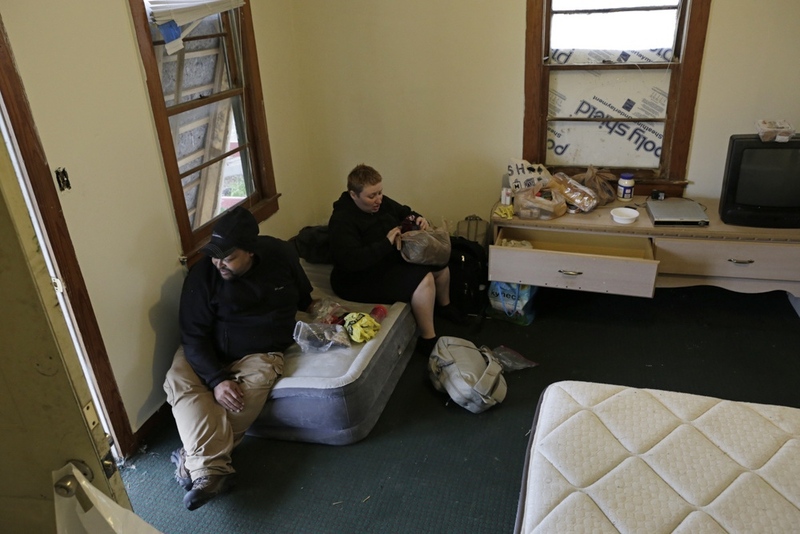 David Nelson and Angel Davis review some of their belongings as they move into Park Cozy Apartments in Cave City, Ky. with Laurie Brown and Michael Brady. 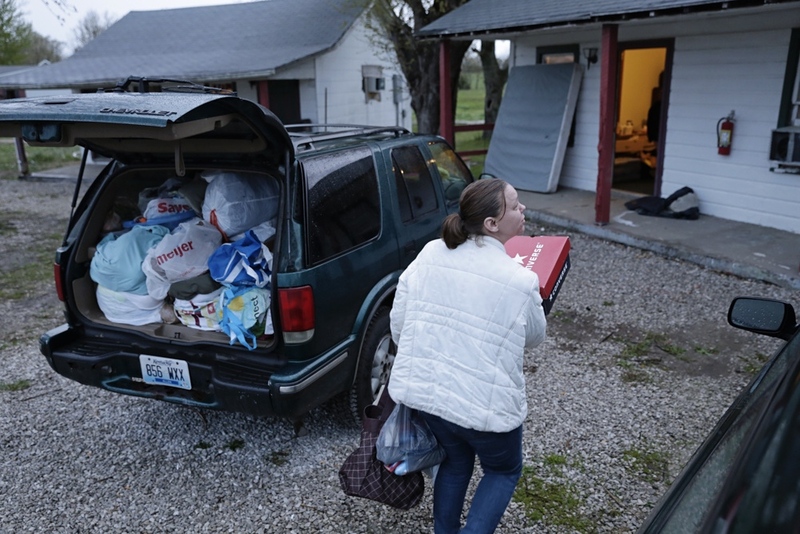 Laurie Brown takes some of her things into Park Cozy Apartments in Cave City, Ky., an extended-stay motel. 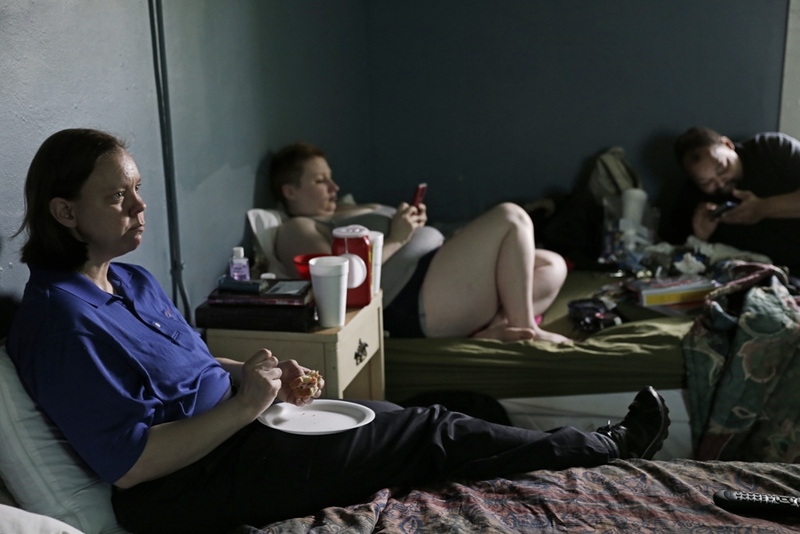 Michael Brady watches TV while his girlfriend Laurie Brown tries to rest on their first night after moving into Park Cozy Apartments, an extended stay motel in Cave City, Ky. They hope this will be permanent shelter until they can move into a proper apartment. 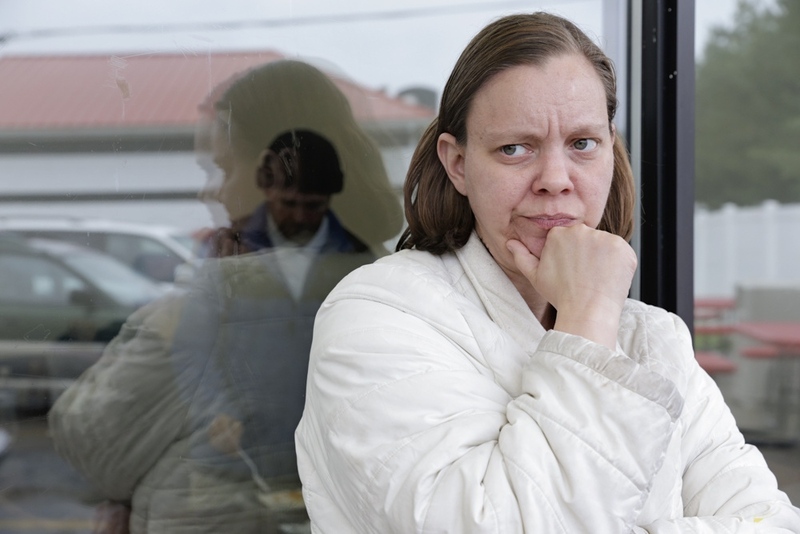 Laurie Brown, her boyfriend Michael Brady and friends Angel Davis and David Nelson have experienced a trail of temporary shelter including particularly hard nights sleeping in a vehicle or storage unit. 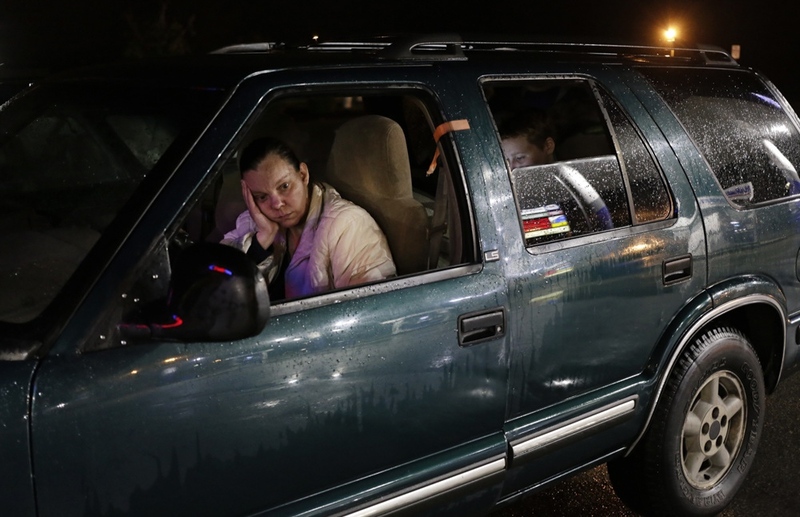 They decided to pool l their intermittent resources in hope to find permanent housing together.